The transport section has to adiabatically guide the beta electrons from the source to the spectrometers, while at the same time eliminating any tritium flow towards the spectrometer, which has to be kept practically free of tritium for background reasons. It consists of a differential pumping section (DPS2F) and a cryogenic pumping section (CPS). In combination they must provide a tritium flow suppression by nine orders of magnitude. Photo of FTICR , 310 mm in length and 83 mm in diameter. 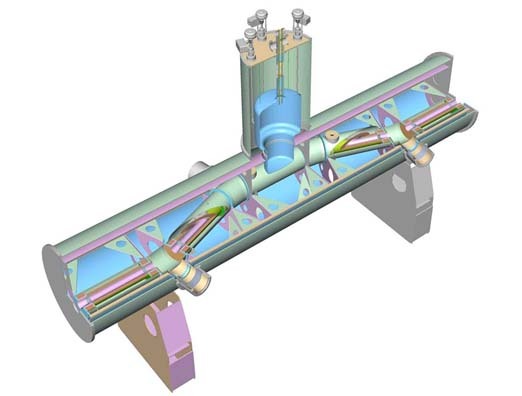 The DPS2F is a pumping section consisting of five 1 m long beam tubes within a superconducting solenoid. To block the line of sight towards the spectrometer for the diffusing, neutral tritium molecules two sections are tilted by 20 degree. Between each section there is a turbomolecular pump with a nominal pumping speed larger than 2000 l/s. In a series of dedicated test measurements it was possible to show, that the reduction factor of the DPS amounts to 2.5x104 . 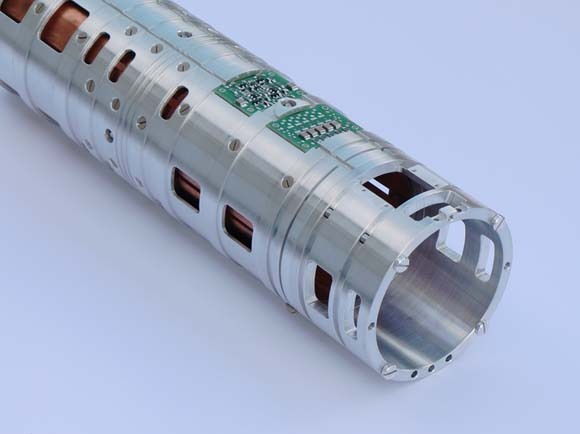 Besides the tritium flow reduction the beam pipe of the DPS hosts instrumentation to analyze and reduce the ion flow. Ions, mostly produced by the decay of tritium into positive charged Helium, follow as charged particles or in form of positive charged molecules the magnetic fields and are blind against the pumping measures. But again, also the charged tritium is not allowed to enter the spectrometers, in order to keep background levels for the neutrino mass search sufficiently low. One trick is to bias the WGTS source and DPS by a little but known negative voltage. This prevents the positive charged ions or molecules to leave the source and DPS section. However, one has to get rid of the positive ions, as otherwise by time the source and DPS would charge significantly electrically up. To actively remove positive ions the DPS hosts with dipole electrodes and Fourier transformation Ion Cyclotron Resonators two kind of instrumentation to analyze the ion species (FTICR) and sweep them out of the beam tube (FTICR&dipoles). 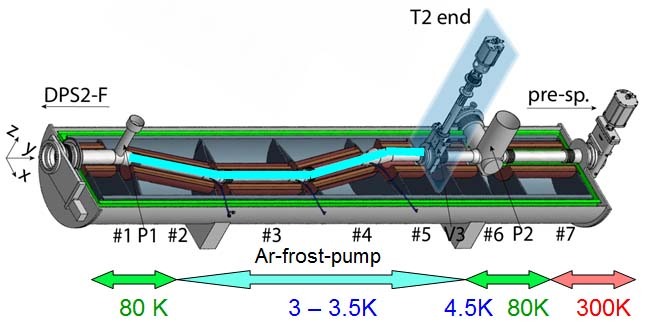 Principle of cryo-sorption of Tritum on Argon frost. Schematics of Cryogenic Pumping Section. The sections below 4 K are used for cryo-sorption of Tritum on Ar-frost surfaces. In this section all remaining traces of Tritium will be trapped by cryo-sorption onto the special prepared cold surfaces of the beam tube. For this, the gold plated beam tube will be covered at 6 Kelvin with Argon frost, which has been demonstrated to be an effcient coating for cryo-sorption of Tritium . 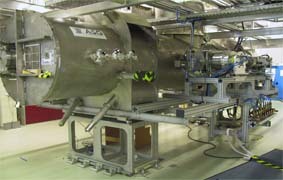 As in the case of the DPS, the beamline has a schicane to block the line of sight for the diffusing Tritium gas and to increase the probability that Tritium molecules hit the wall. The electrons are guided up to 5.6 Tesla unaffected by the cryotrap by magnetic fields towards the spectrometer. After approximately 60 days of operation the surface is saturated with Tritium and the system is warmed up to 100 K releasing the trapped Tritium. In parallel the released Tritium is removed by turbomolecular pumping with a cold valve being closed towards the spectrometers. So at the end of the CPS, all tritium has been taken out of the beam, suppressing the partial pressure of tritium by 12 orders of magnitude compared to the inlet in the middle of he WGTS. On the other hand, the electron flow has been unaffected and has been guided adiabatically towards the spectromter. Now it is the task of the spectrometers to analyze as precisely as possible the kinetic enery of the beta electrons.